Halloween is near and our Disney Princess is preparing a spookylicious treat for this special event! The Halloween Ice Cream is on her list, so why don’t hurry up to join her in and give her a precious hoping hand? There are some many spooky decorations prepared to decorate Snow White’s Halloween ice cream with… just browse though them all and select your favourite. Once you’re done, pick a top to match as well! 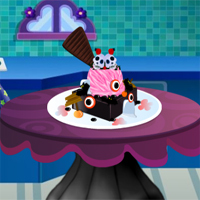 Have a great time playing the ‘Princess Halloween Ice Cream’ game for girls!